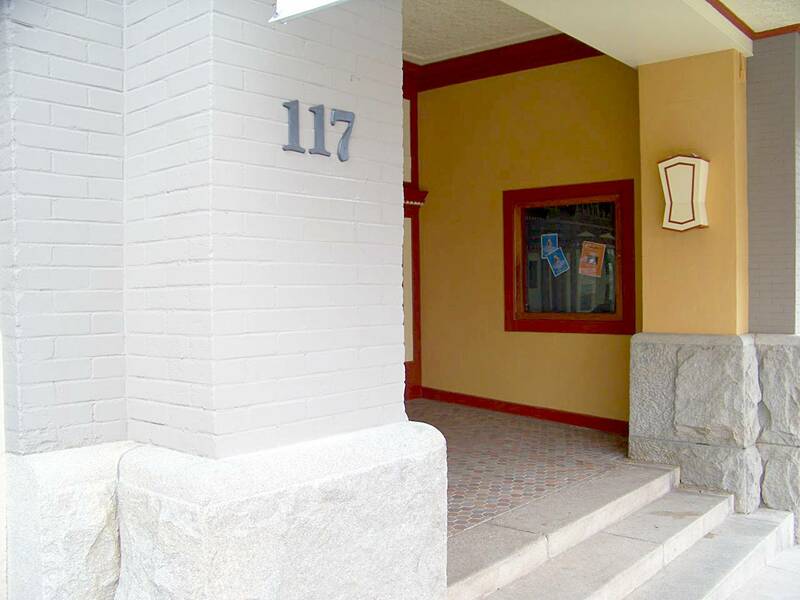 Elks Opera House | Prescott Rocks! Every day, in so many ways, Prescott Rocks! 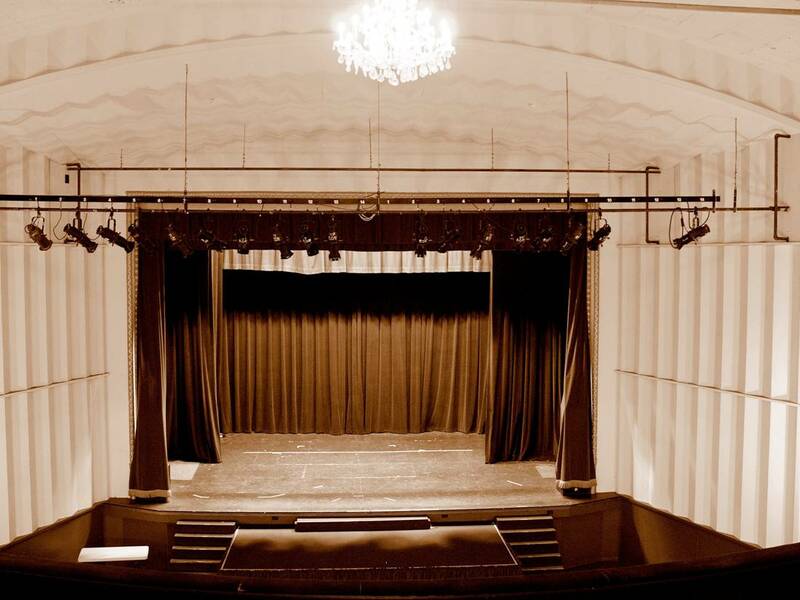 You are currently browsing the category archive for the ‘Elks Opera House’ category. My wife Liz and I remember attending the original stage production of this wild “musical” show over 35 years ago at the Royal Court Theatre in staid London. On Saturday October 23 at 7PM we attended the Lonesome Valley Playhouse’s presentation of Prescott Independent Theatre’s production at the Elks Opera House in what some would say is staid Prescott. 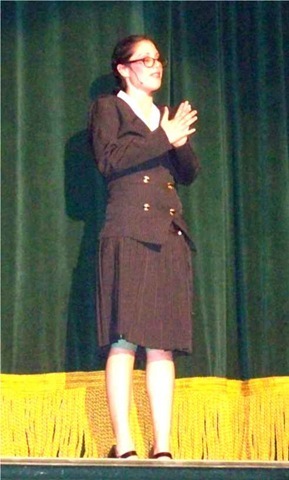 I think the pictures of some members of the audience dressed “in character” will dispel that conclusion. The ole town is a changing! 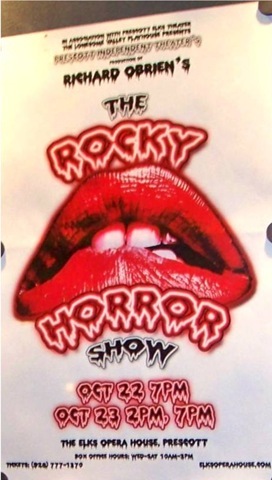 The Rocky Horror Picture Show is a cult tradition, some would say the classic cult tradition. It is a parody and a cross between science fiction and B-movie horror films. I talked to Deputy City Manager Laurie Hadley after the Saturday night performance and they did not have to eject anyone during that performance. However, on Friday they did have to eject someone. 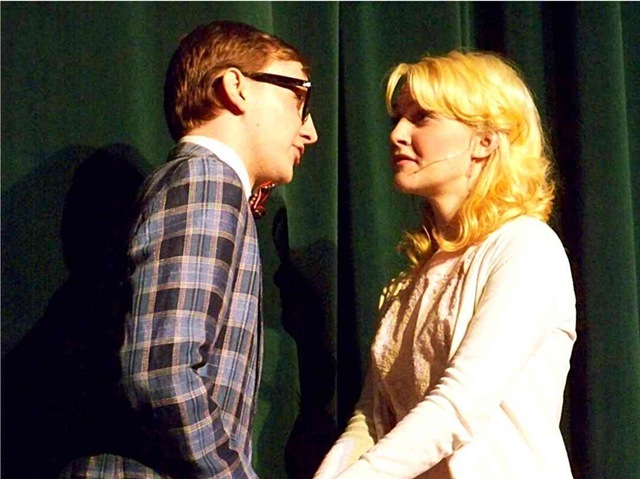 At the beginning of the show Brad Majors and Janet Weiss are depicted as “square” innocents, but that would soon change radically. This is a musical and there are several musical numbers. The first was “The Time Warp.” See the Wikipedia entry for a complete synopsis of the stage production and movie: The Rocky Horror Picture Show. Brad and Janet soon learn this is no normal castle! And here we have Dr. Frank-N-Furter, a sweet transvestite from Transsexual, Transylvania and his creation Rocky Horror. That night Dr. Frank-N-Furter does serial seductions of both Janet then Brad. The dialogue in both seduction scenes is the same. After his seduction by Dr. Frank-N-Furter, Brad is transformed. 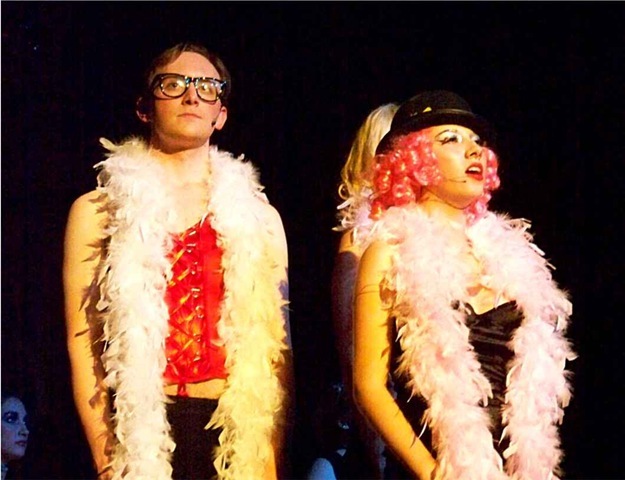 After her seduction by Dr. Frank-N-Furter, Janet tries to get it on with Rocky Horror. Dr. Frank-N-Furter near the end of the show in the “I’m Going Home” musical number. This performance drew a large crowd. The balcony was very popular for those dress “in character” and it was nearly filled. The main floor was about 3/4 full. Here we have Joseph Brehm, City of Prescott Management Analyst (black shirt) and Laurie Hadley (Deputy City Manager) working the concession counter. No wine or beer was available (drat) as they are still waiting for approval of their liquor license from the state. 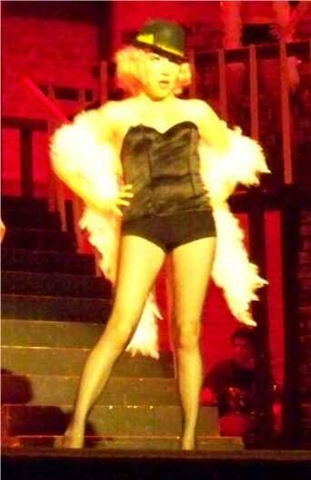 This is a male dressed in drag as the lead character Dr. Frank-N-Furter. I shot this during intermission. The cast list, director and producer courtesy of Andrew Johnson-Schmit. All photographs by Jack D. Wilson. Unauthorized use prohibited without prior permission. If you found this article helpful, please leave a comment or forward to a friend. 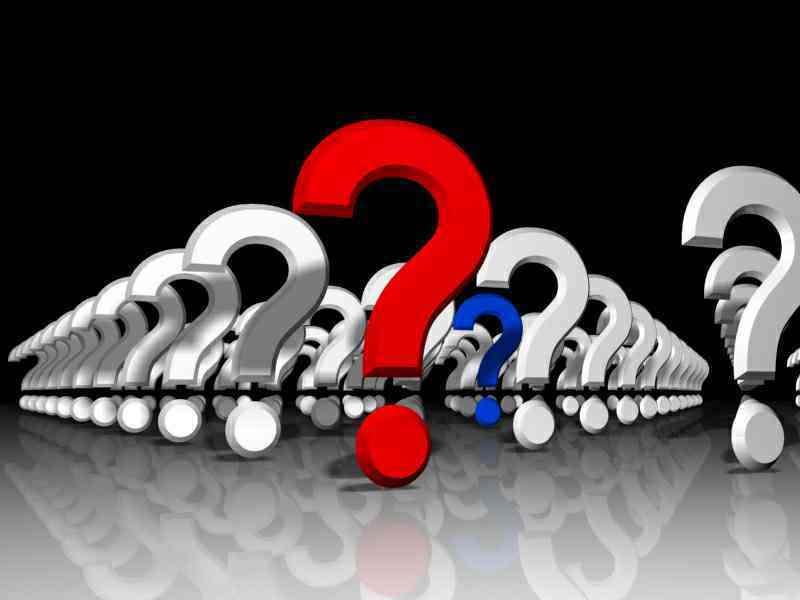 If I missed something that you found along the way, leave a comment and I will try to update the information. Jack D. Wilson first visited Prescott in 1995 and has been a resident since 2000. He took a sojourn into politics and was the mayor of Prescott Arizona from Nov. 2007 – Nov. 2009. He now writes a couple of blogs and is President of the Prescott Frontier Days Community Service Foundation. This is the seventh and final installment in this series about the Elks Opera House in Prescott Arizona. The series opened with a capsule history of the founding of Prescott in 1864. The previous installment covered the restoration the Elks Opera House has undergone. It now has reached twin pinnacles, representing the best of the past and the best of the present. The best of the past is the opulent and painstaking restoration it underwent. The best of the present are the hidden innards that allow for productions of any kind. That brings us to a point of commencement on this journey of the Elks Opera House. 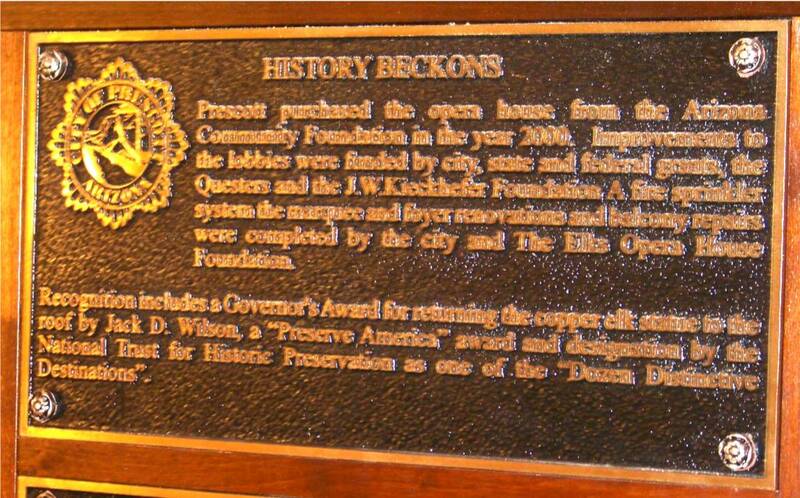 When it was all over the Elks Opera House Foundation raised over two-million dollars in support of the restoration. The outpouring of public support speaks volumes about the importance of the Elks in this community. It is somewhat bittersweet to reach the final installment in this series, so I would like to suggest this is not the end of our journey, but a new beginning. I used the term “point of commencement” to describe where the Elks is today. It is at the beginning of a new journey. The Elks building is a condominium with two pieces. The Elks Opera House, which is owned by the City of Prescott and the remainder of the building, owned by a law firm. The City of Prescott would like to get out of the theater management business. The law firm that owns the rest of the building would like to sell their interest. In my opinion, the ideal situation for the Elks Opera House Foundation is to own and manage the entire building, because then it would be financially viable and sustainable. Now that the restoration of the Elks Opera House is complete, it is time to finish the rest of the journey. The Elks Opera House Foundation needs to raise the funds to buy the portion of the Elks building owned by the law firm. The foundation has been raising funds for years and some of the board members could use some help. Prescott has been a retirement destination since the 1990’s Money Magazine article brought it to prominence. If you retired here and have played golf for a couple of years and your inner heart tells you “there is more for you to do,” you may be a good candidate to help the foundation. If you have fond memories of the Elks, we encourage you to share those via a comment. Also, please let your friends know about this series of articles about a true gem in Prescott Arizona. Parker Anderson is the official Historian of the Elks Opera House. He spent thousands of hours compiling all known bookings in the first 100 years of the Opera House. Jack Wilson is the former Mayor of Prescott Arizona. He has had a long interest in history having founded two neighborhood historic societies in Chicago. 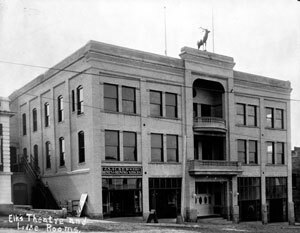 He was instrumental in providing the funds that allowed “Bill the Elk” to return from Prescott Valley to his rightful perch atop the Elks Opera House. As president of the Thumb Butte Questers, he coordinated the fund-raising match with Prescott Quester chapters for the Arizona Heritage Fund grant that was used to restore the inner or second lobby. The prior installment covered the period of “Resurrection and preservation,” 2000-2008. 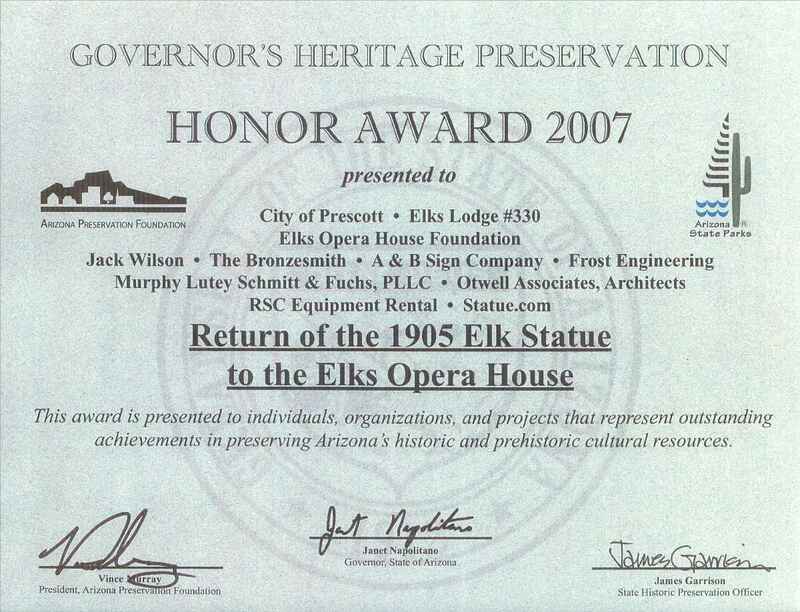 This was when the City of Prescott purchased the Elks Opera House (as a condominium portion of the Elks building) and the Elks Opera House Foundation was organized by a group of Prescott citizens in late 2002 as a non-profit, tax-exempt Arizona corporation. 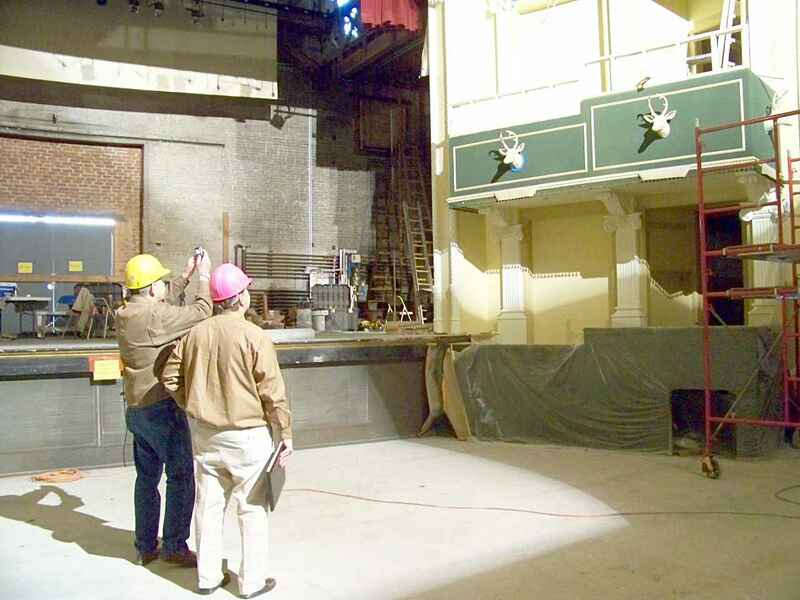 The initial steps at restoring the Elks Opera House occurred; the restoration of the outer and inner lobbies and the return of “Bill the Elk” to his perch atop the Elks Opera House. These seminal efforts were important forbearers of the much larger and comprehensive restoration effort covered in this installment. I took the picture above on Monday, July 19, 2010. Final cleanup and equipment testing was underway. There had been a problem with the stage grand drape and it was still in New York being modified but the stage grand valance was in place. The eight Opera Boxes look fantastic. Everywhere you look there are little surprises, as the attention to detail during this restoration was outstanding. We will see many examples of that as we proceed to look in detail at the actual restoration. 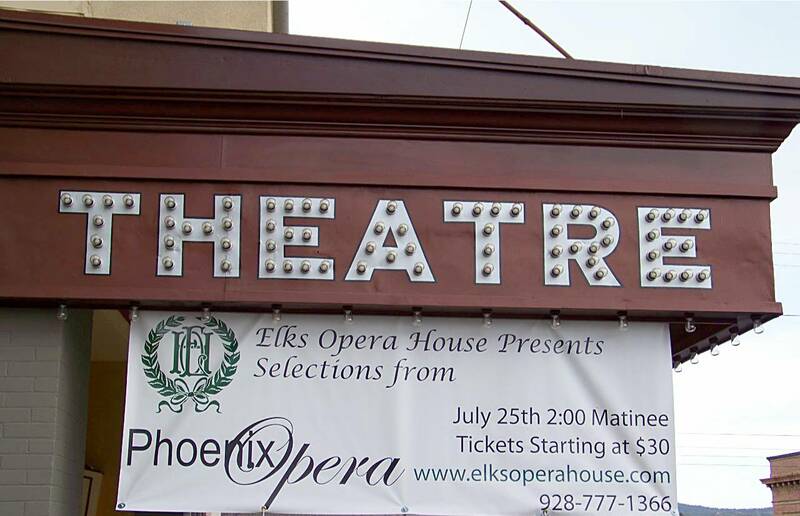 I was the mayor of Prescott Arizona when the Elks Opera House ‘went dark” on July 1, 2009 to begin a yearlong restoration process; it reopens on July 24, 2010 with a gala celebration featuring selections from the Phoenix Opera. Prodigious fund raising by the Elks Opera House foundation raised more than $1.7 million for this restoration. An early donation of $1-million dollars from the Harold James Family Trust kicked the fund raising into high gear (the trust later added an additional $250,000 donation). I was involved with historic preservation and restoration for nearly 20 years and this project exemplifies the painstaking planning and attention to details required for a great restoration. I closely monitored the restoration process and the results are truly breathtaking. The end product will surprise many Prescott residents who have fond memories of the Elks as a movie theater; hence I thought the title “Restoration par excellence” was fitting. This restoration brings the Elks back to its splendor when it opened in 1905. I have tried to present a sampling of the restoration highlights in this article; however, you cannot fully appreciate what has been accomplished until you actually see it. Please note that the following photos were taken on July 16 and July 19 while final restoration was still in progress. When the newer marquee was removed, the original marquee was found underneath – that was a pleasant surprise. Here is the restored ticket booth that gives a hint of the restoration inside. When the modern façade was removed, the original exterior façade was discover intact – again, another pleasant surprise. New plush carpet in the lobby and stairway to the balcony. 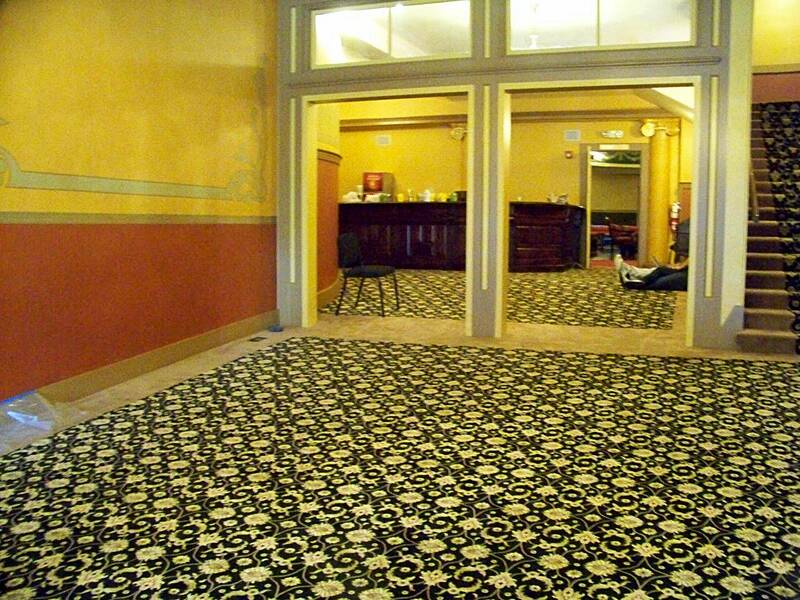 New carpeting was install throughout the Elks. Here are the lobbies with the stairway to the balcony. This is excellent quality carpet with excellent padding. 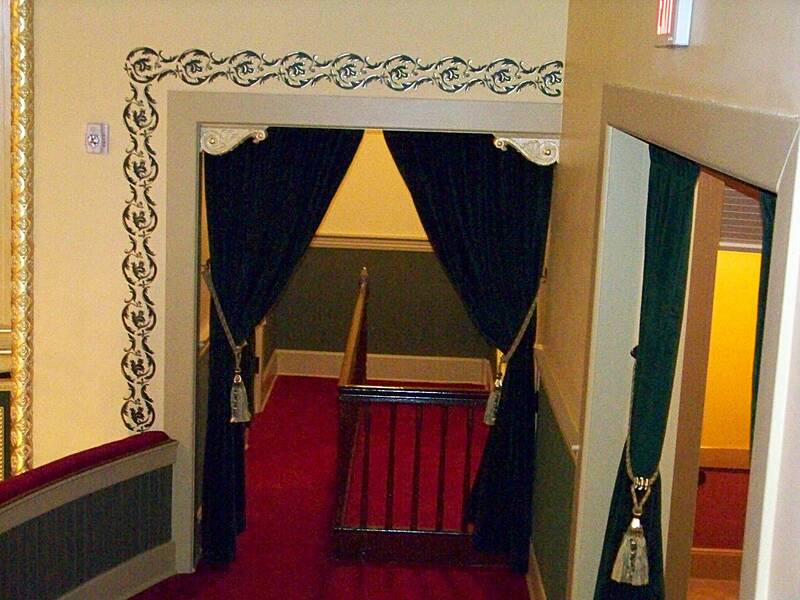 Here we see the balcony entrance through a set of plush drapes. Note the padded top on the front balcony rail. The balcony was near collapse when the restoration began. Haley Construction shored it up with steel beams. 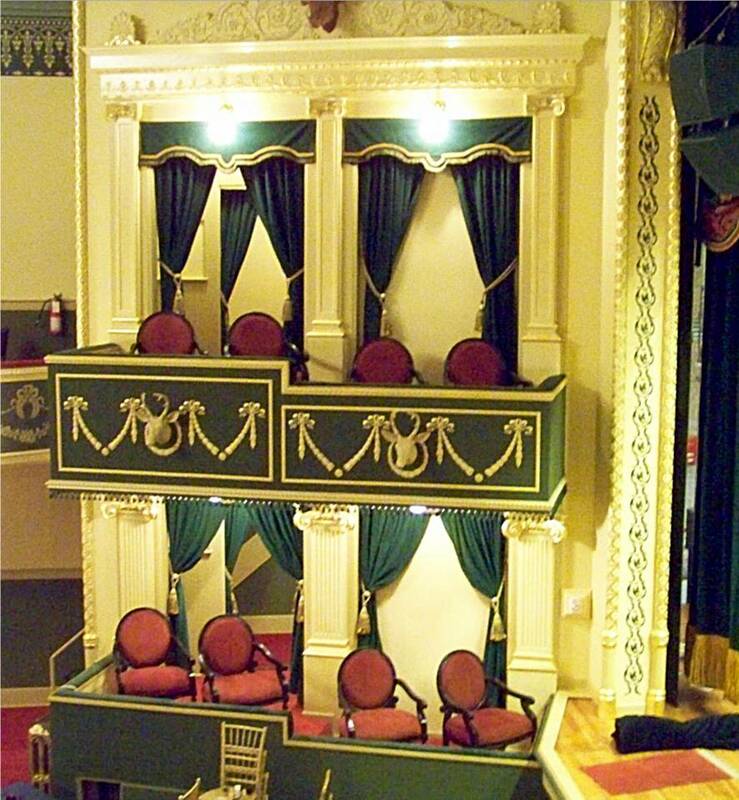 Originally there were stairways to the balcony Opera Boxes. These are long gone, but you can see where they were. 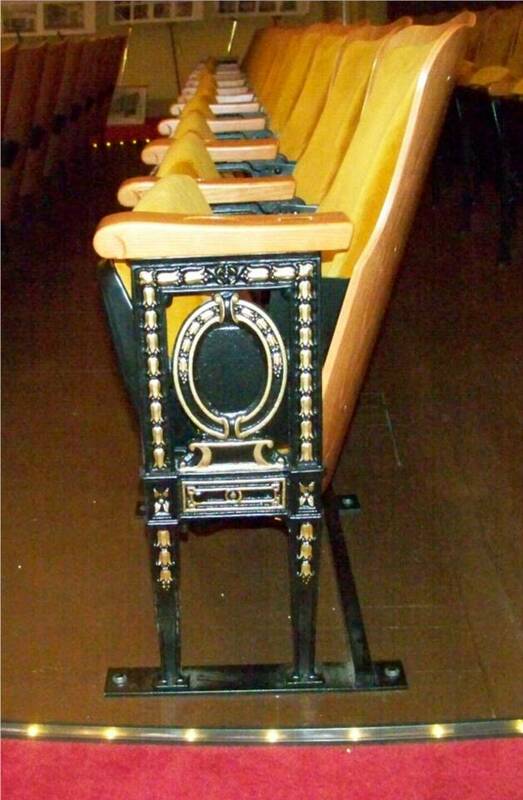 An opera house needs opera boxes and now it has them; the eight opera boxes including the Elks head decoration and fancy fringes have been restored. Each set of two boxes will have an attendant at performances allowing you to order refreshments of your choice. One of the common complaints about the Elks before this restoration was about the uncomfortable seats. I think people will enjoy the new seats, I tried one and they are quite comfortable. This article is called “Restoration par excellence” and I attribute much of that to painstaking planning that proceeded the restoration and an absolute focus on getting the details correct. This is quite evident in the restoration of the beautiful tin ceiling, stenciling and ornamental plasterwork throughout the theater. In this era of planned obsolescence, here we have a celebration the best in handcrafted details. 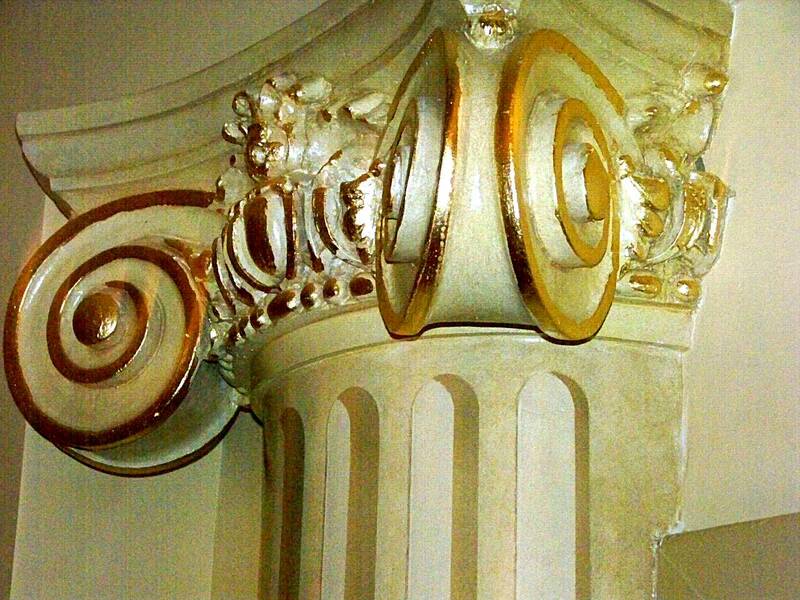 Above to the right is a molded decorative plaster column with gold embellishment next to the Opera Box. 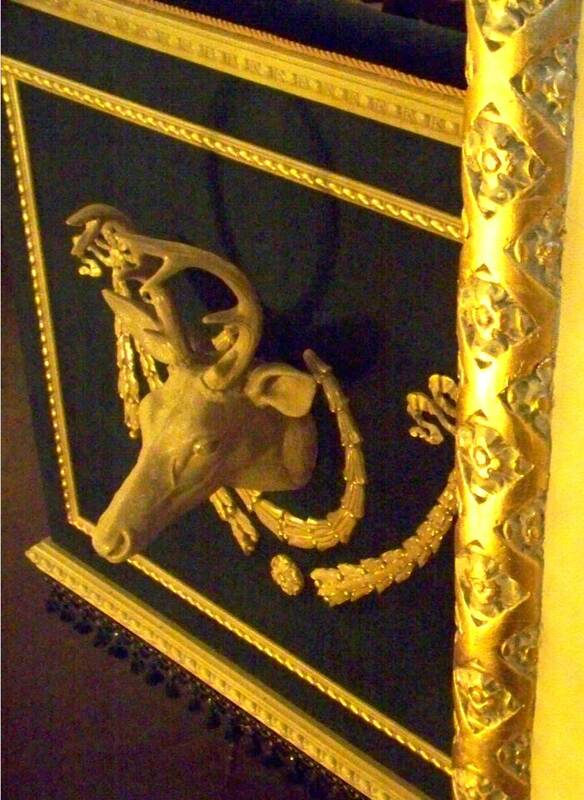 On the Opera Box your eye is drawn to the Elks head, which is surrounded by additional decorative plaster with gold embellishment. 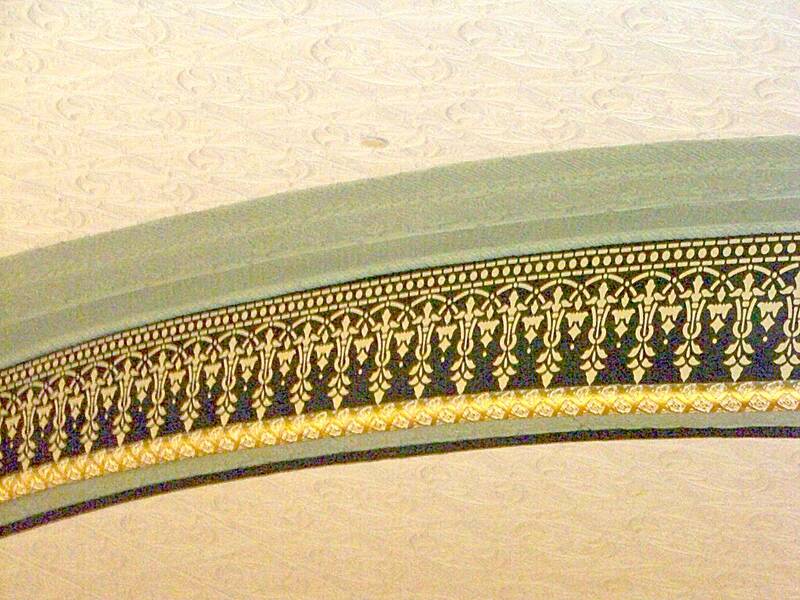 But look closely at the bottom edge of the Opera Box – there are green tassels running along the edge! Besides the painstaking restoration, attention was paid to ensure equipment and facilities for productions are state of the art. New steel beam supports for the balcony which was close to collapse when the restoration began. Updating the lighting and sound equipment. The sound system upgrade includes a 9” under-floor channel from the alley behind the house to the stage and to a sound control console. That will allow national acts to park a sound trailer in the alley and connect through the channel. Provisions were also made for hanging large speakers in front of the stage for such acts. Providing state-of-the-art audio/visual equipment to support meetings and conferences. In addition to dual digital projection facilities this includes High Definition TV upload and download and Internet access. Two flat screen monitors in the lobby, one at the balcony stairs and one at the concession stand, to display announcements and messages. Local architectural firm Otwell Associates Architects (Bill Otwell owner) was responsible for the overall planning with Wayne Sanford as the Project Architect. Local contractor Haley Construction managed the construction, with Project Manager Lee Vega overseeing the day-to-day work. Local firm Custom Surface Innovation Inc. (owners Shari Stura and Luis Sanjurjo). The tri-layered vinyl stage backdrops are the work of Custom Surface Innovation Inc. I talked to one of the principal of that firm, Shari Stura, while shooting photographs of the restoration and found out she moved to Prescott from Chicago, as I had. Local firm A&B Signs replicated the replacement light ring from a partial photograph. Prescott native Perry Wieweck is president of A&B Signs. This is the sixth in a series about the Prescott Arizona Elks Opera House in Prescott Arizona. We hope that you have enjoyed this comprehensive history of the Prescott Arizona Elks Opera House. 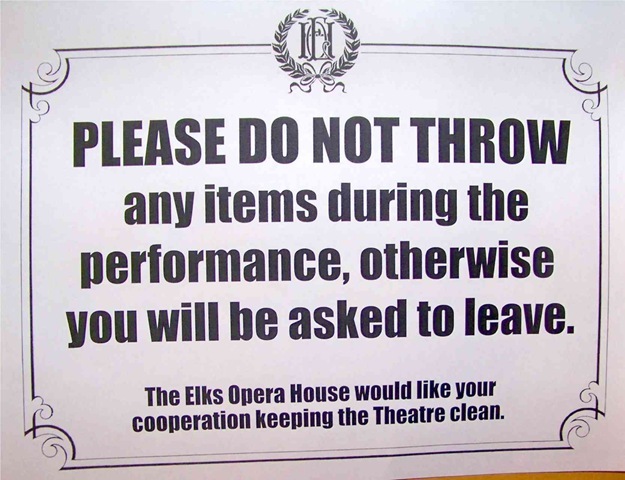 In the next and final installment, we will cover the future of the Elks Opera House. Jack Wilson is the former Mayor of Prescott Arizona. He has had a long interest in history having founded two neighborhood historic societies in Chicago. He was instrumental in providing the funds that returned “Bill the Elk” from Prescott Valley to his rightful perch atop the Elks Opera House. As president of the Thumb Butte Questers, he coordinated the fund raising match with Prescott Quester chapters for the Arizona Heritage Fund grant that was used to restore the inner or second lobby. Current foundation board members include: John Olsen, Chairman, Ralph Weiger, Vice-Chairman, Elisabeth Ruffner, Secretary, Arnold Gray, Treasurer, Cathy Church, Maxine Dilliahunty, Marilyn “Dinny” Henze, Gail Mangham, Debra Matthews, Russell J. Parker, Anthony Reynolds, Frank Sente and Paul Wulff. The Elk that sits proudly atop the Elks Opera House has always been called “Bill the Elk.” However, nobody knew why he had that name, but that mystery has been solved. It took two pieces of information to solve that puzzle. The first was discovered during the renovation process in 2010. At the 100th Anniversary Celebration for the Elks Opera House, Elisabeth Ruffner asked me to purchase a new chair for $500-. I told Elisabeth a chair was not of interest, but that I was interested in bringing the original “Bill the Elk” back to Prescott where it belonged from Prescott Valley. I pledged up to $10,000- to help make that happen. It took almost two more years, but it did happen. A replacement Elk was purchased for the B.P.O. 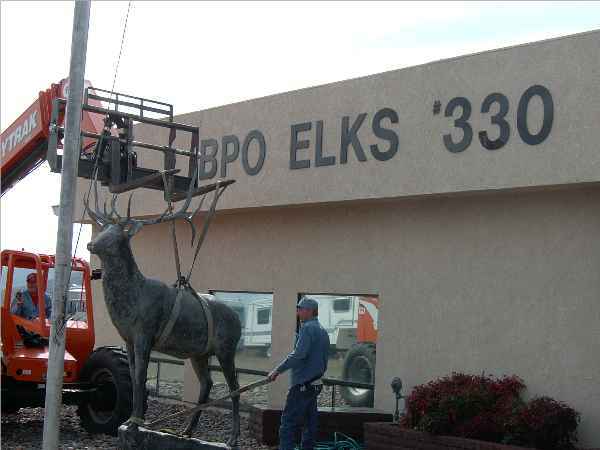 Elks Lodge 330 in Prescott Valley and “Bill the Elk” was removed and taken to Bronzesmith in Prescott Valley for restoration. Ed Reilly, owner of Bronzesmith, inspected “Bill” and found out he had been used for target practice as there were several bullet holes in his copper-skinned body that needed repair. He also needed to add strength to the antlers mounting and to repair water damage to the legs. “Bill” the Elk is not cast bronze as many people suspected, but pressed sheet copper (the same as the Statue of Liberty). Shane Whitcher, a metal finisher with Bronzesmith, repaired fourteen (14) bullet holes in the statue. “Bill” the Elk was returned to his rightful perch atop the Elks Opera House with a festive red scarf and was lit for the first time for the Acker Music Festival on Friday, December 8, 2006. Everyone involved in this effort contributed their services or money. Janet Napolitano honored those involved with a 2007 Governor’s Heritage Preservation Honor Award for the Return of the 1905 Elk Statue to the Elks Opera House. The Elks Opera House Foundation was instrumental in raising funds for restoration of the outer lobby. The inner lobby was restored with funds from an $40,000- Arizona Heritage grant that was matched by the four Prescott Questers chapters. This is the fifth in a series about the Prescott Arizona Elks Opera House in Prescott Arizona. In the next installment, we will cover the period of restoration in the period 2009-2010. Jack Wilson is the former Mayor of Prescott Arizona. He has had a long interest in history having founded two neighborhood historic societies in Chicago. He was instrumental in providing the funds that allowed “Bill the Elk” to return from Prescott Valley to his rightful perch atop the Elks Opera House. Update note: The power of the Internet and blogs by citizen journalists has proved itself again. After this installment was originally published, emails were received first from Roger Pearsall and then from Ron Swartz, partners and founders of Timberline Productions. They provided additional information about their involvement in the renovation of the Elks, including a 1982 brochure for the Gala Re-Opening that we had not seen before. Roger and Ron rented a building on Union Street owned by Don Head that was directly behind the Elks. That building housed Timberline Production while it was in Prescott. It grew into a nationally recognized corporate events and presentation business based in Phoenix with 150 employees at one time Thank you Roger and Ron for sharing your part in the history of the Elks Opera House. This installment is called “Turmoil” as the period from 1981-1999 was turbulent and saw many changes and challenges where the very existence of the Elks Opera House was called into question. But, before we get into that period of time, let us flash back to one of the events that was a precursor for the turmoil – the move of “Bill the Elk” to Prescott Valley. 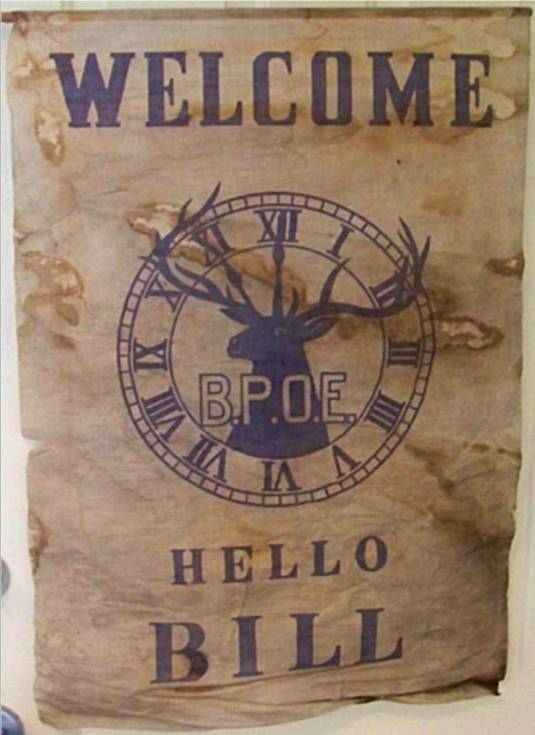 “Bill” was removed 1971 and taken to the Elks Club, B.P.O.E. #330 when they moved to their new building in Prescott Valley. He was destined to stay in Prescott Valley for 35 years before his return to Prescott. A future installment will go into detail about the return, restoration and reinstallation of “Bill the Elk” atop the Elks Opera House. After the long-time manager Claude Cline retired in 1980, owners Don Head and Phil Toci signed with a group called Timberline Productions to take over management of the Elks Opera House. Timberline continued to run the Elks as a movie theater until very early 1982 (January or February), when Don Head and Phil Toci announced they were going to bring back live entertainment full-time. “My partner, Roger Pearsall, and I had expressed our interest in the theatre as a historic site to owners Don Head and Phil Toci. 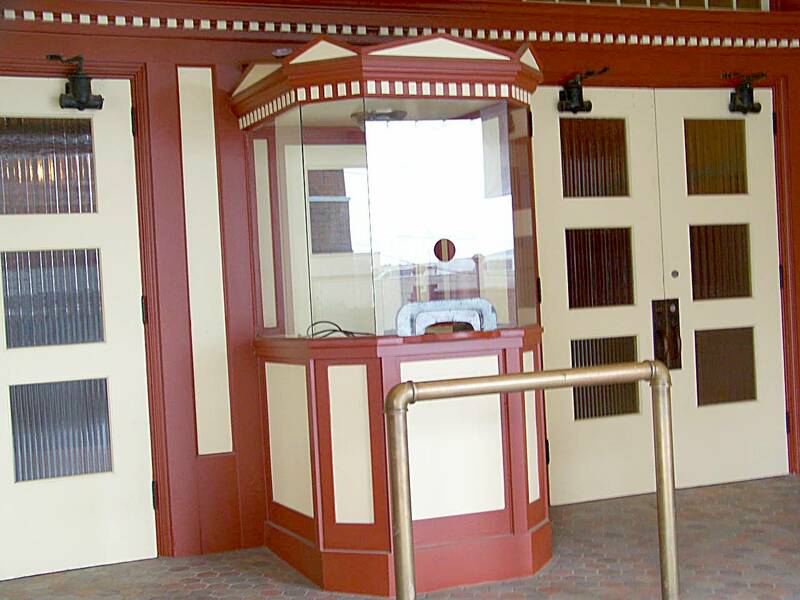 Don approached us to help them return the theatre to operating condition so that motion pictures could once again be shown. Also, it was Don Head’s longer term desire to bring live professional theatre to Prescott. We agreed to assist with the renovation and the replacement of the motion picture equipment. Bill Otwell (Otwell & Associates) was brought in to oversee the rehab. The lobby was reconfigured with a new concession stand and new rear entrance to the auditorium. Restrooms were moved and rebuilt. The projection booth was upgraded, additional power provided for new projectors and film platters. Rigging in the stage house was re-assessed. A new main curtain and projection screen were installed by Curran Productions of Los Angeles (The winch and rigging for the chandelier were also installed at that time). 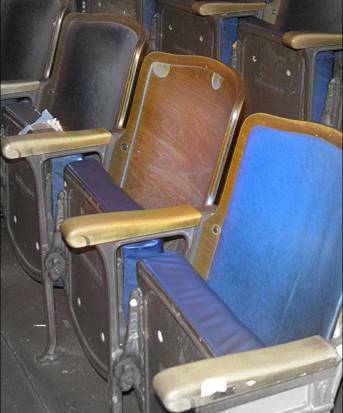 The theatre interior was repainted and the seats reupholstered. House lighting was upgraded with replica period brass fixtures. 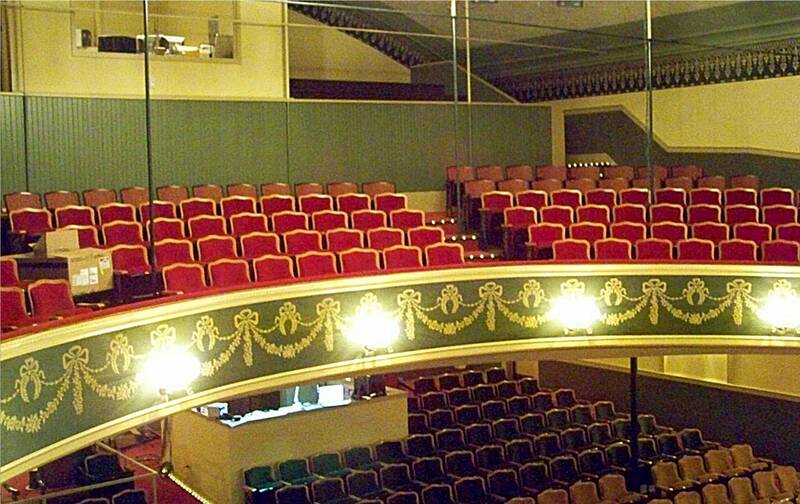 Upon completion, the theatre was re-opened as the Elks Opera House. 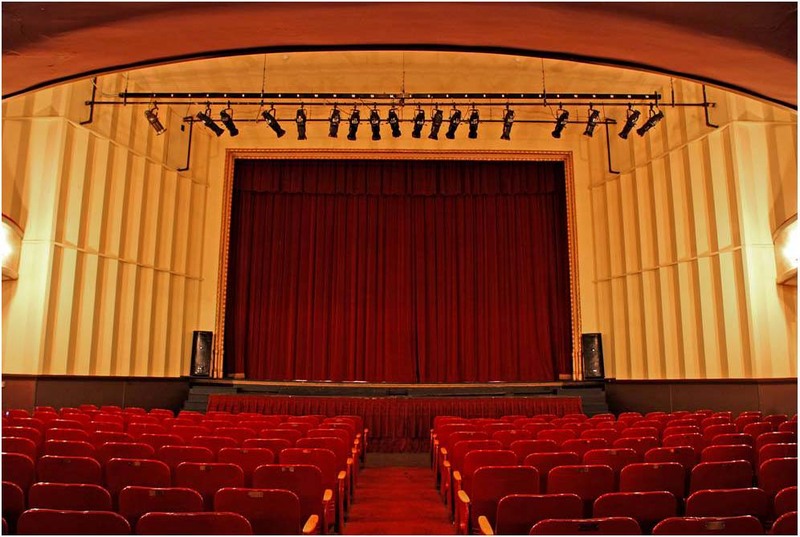 Timberline Productions managed the operation of the theatre as a movie theatre for a period of approximately two years. The financing as well as the direction of the renovation was in the hands of the owners, Head & Toci. In the fall of 1981, Don Head expressed his desire to move to live theatre. 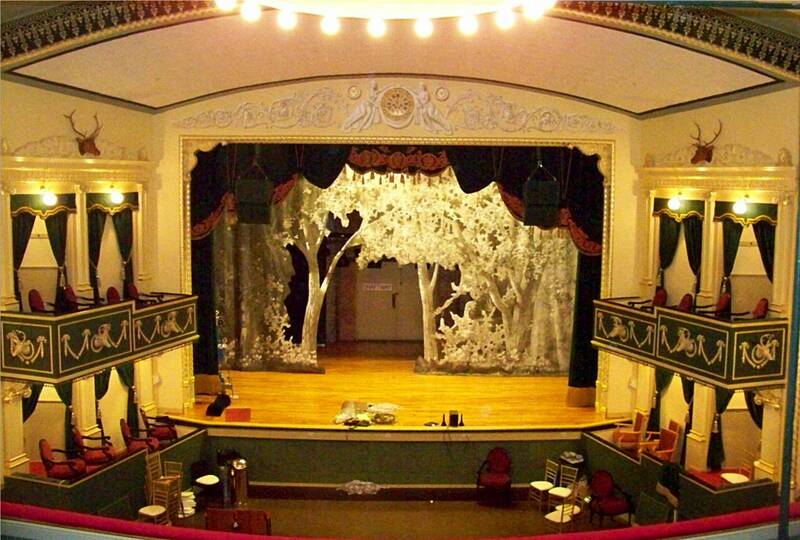 The role of Timberline Productions in the Elks Opera House changed to that of technical advisors. Don Head created the Prescott Center for the Performing Arts as a non-profit organization to run the theatre and establish a live theatre season. He hired Gilbert Laurence from Los Angeles to be Managing Director. Laurence hired the Megaw Theatre, Inc. of Northridge CA to stage a season of plays that included Romantic Comedy by Bernard Slade, The Rainmaker by Horton Foote, The Corn is Green by Emlyn Williams and the musical, Company by Stephen Sondheim. 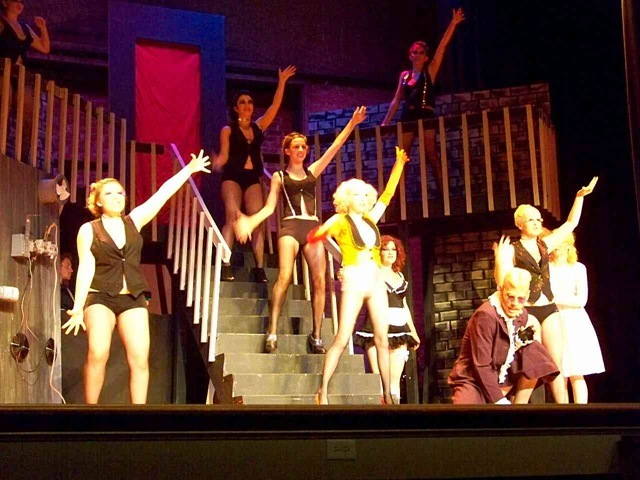 These were all first-class productions with scenery, lighting and professional equity-waver casts. The productions were well received by those who saw them but alas, the top ticket price of ten dollars was a little steep for the locals who complained “Why spend 10 bucks to see people we don’t know when we can go to the Fine Arts and for 4 bucks see all of our friends in Music Man and the HS band will perform as well.” Who can counter an argument like that. Other lesser groups were booked with similar results. There were a couple of fine classical concerts that performed in the Elks that fall with one being a performance of the Phoenix Symphony (They raved about the acoustics). 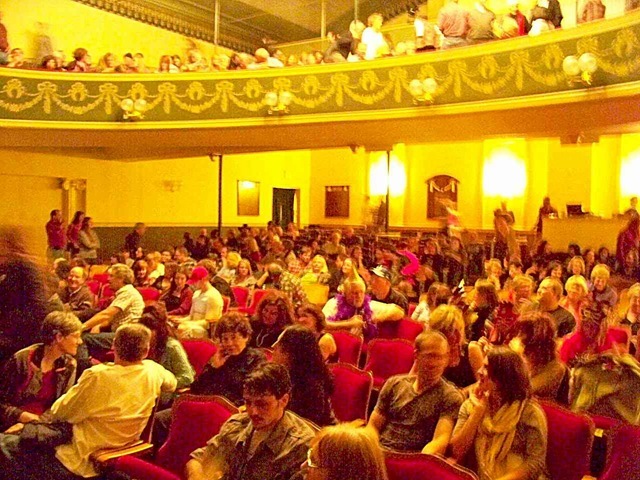 The Prescott Center for the Performing Arts were fine people who had the best of intentions, but they booked top quality professional before they had the money to pay for them–they counted on advance ticket sales to bring in this money, and when the ticket sales did not materialize, disaster hit. The acts cancelled in droves, and the stewards took to holding rummage sales in a desperate bid to raise money. Acts that did perform included the noted actor Kevin McCarthy playing Harry Truman in a one-man show, GIVE ‘EM HELL, HARRY! Also the Sons of the Pioneers performed. However, many shows cancelled because they were not paid, including Vincent Price who was going to appear live, and did not and a professional tour company of MAN OF LA MANCHA also cancelled. 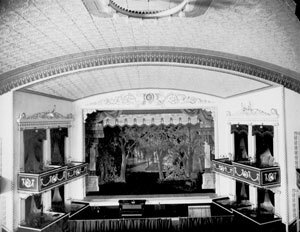 During the tenure of both colleges, the Elks Opera House hosted a wide variety of entertainments, both professional and locally produced. On April 30, 1999 Daily Courier reporter Sandy Moss wrote an article “Elks Theater feels its age” that detailed the failing systems, including the boiler and lighting at the Elks. As this installment draws to a close, the Elks teetered on the edge of total collapse; however, that changes in our next installment. This is the fourth in a series about the Prescott Arizona Elks Opera House in Prescott Arizona. In the next installment, we will cover the period of “Resurrection and Preservation” in the period 2000-2008. This is the third in a seven-part series about the Prescott Arizona Elks Opera House and focuses on its later history in the period 1943-1980.It was the middle of World War II in 1942 when Claude Cline took over management of the Elks Theater. He would manage it until 1980, becoming the longest-serving manager to date. Mr. Cline ran it as a straight movie theater. There are still old-timers in Prescott who have happy memories of seeing movies in the Elks, and while it may be unpopular to say this, the Elks may have shown more life as a movie theater than it ever did as a live stage facility! As the years rolled on, both fashions and technology changed. The original movies in the Elks were “talkies,” but by the middle 1940s movie technology had made major advancements. 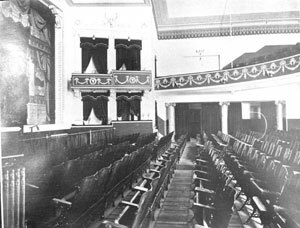 The original box seats with their Elks head décor seemed out-of-place in a “modern” movie theater. Manager Cline also was responsible for the remodeling we most remember today; in the winter of 1945-46, he took out the box seats and removed all of the ornaments and ornamental finishes including the elk’s heads, the clock, etc. to accommodate wide-screen movies. To gain some historical perspective, World War II had ended, troops had returned home and everyone was looking for entertainment to put the war behind them. The “fluting” wall he installed over the boxes was supposed to enhance the picture quality and sound. An inside box office also eventually disappeared as did a second set balcony stairs. Today, historic building preservation is a watchword for many, but it was unheard of back then. In hindsight, we might be angry with Claude Cline for what he did, but in 1945, no one thought a thing of it. Remember, this was the same period that it was fashionable to paint natural golden oak woodwork in Victorian with white paint to “update” their look. To give everyone a “teaser” look of what is to come, here is a picture from the early part of the restoration putting the boxes back in place. In 1968, the Elks Lodge decided to sell the building for reasons that are unknown. They continued to rent their lodge rooms from the new owners until their new Prescott Valley facility was complete in 1971. 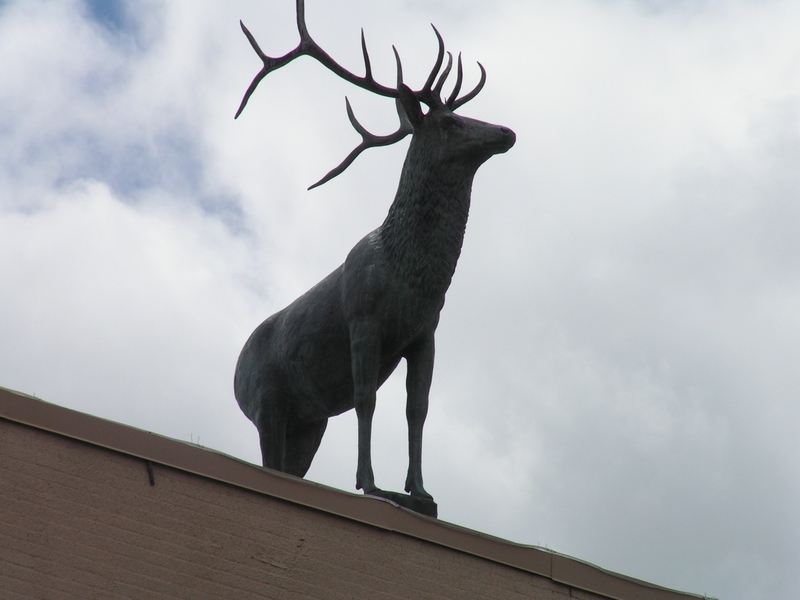 When they vacated the Elks building in Prescott, they took the big copper elk atop the roof with them (affectionately known as “Bill the Elk”).The Elks Theater went through a couple of short-term owners before being purchased by Don Head and Phil Toci, both attorneys. Claude Cline kept his lease on the theater, but in 1973, he built and opened a new facility, the Marina Twin Theatres, located where the Social Security office is today. At this point, Mr. Cline scaled back activity in the Elks, turning it into more of a family theater. From 1973 until his retirement in 1980, Cline showed family films in the Elks, as well as second-run PG movies. Under these conditions, he had the Elks open mostly on weekends only. Some recent writers have contended that the Elks was closed completely between 1973 and 1980; however, that is simply not true.Claude Cline retired in 1980, giving up his lease on the Elks Theater. Shortly afterwards, owners Head and Toci divided the building into two separate condominium units, selling the theater portion to the Arizona Community Foundation.This is the third in a series about the Prescott Arizona Elks Opera House. In the next installment, we will cover the period of turmoil in the years 1981-1999.If you have fond memories of the Elks, we encourage you to share those via a comment. Also, please let your friends know about this series of articles about a true gem in Prescott Arizona.About the authorsParker Anderson is the official Historian of the Elks Opera House. He spent thousands of hours compiling all known bookings in the first 100 years of the Opera House.Jack Wilson is the former Mayor of Prescott Arizona. He has had a long interest in history having founded two neighborhood historic societies in Chicago. He was instrumental in providing the funds that allowed the original “Bill the Elk” to return from Prescott Valley to his rightful perch atop the Elks Opera House. On top of the Elks Opera House is “Bill the Elk”. Everyone wants to know why he is called Bill and we will cover that in a future installment. It is an interesting story, especially how we finally figured out why he is called Bill. The elks Opera House c1915. Photo UBP Sharlot Hall Museum. Reuse only by permission. In 1910, the Elks Lodge decided to stop operating the Opera House themselves, and leased it out to an independent manager (this would remain policy for the rest of the years the Lodge owned the building). The first manager to get the lease was Charles Howard, who ran a vaudeville house on Cortez Street. He turned the Elks into a vaudeville house, which meant they had vaudeville acts every night, plus movies (which only ran about ten minutes each in those days). Movies arrived at the Elks in 1910, and stayed. The 1915 film masterpiece, Birth of a Nation, was shown at the Elks in 1916. During the silent film era, the theater had a small orchestra to provide the accompanying music. By 1929, the silent movie days were over, their demise owing to the Western Electric sound system. 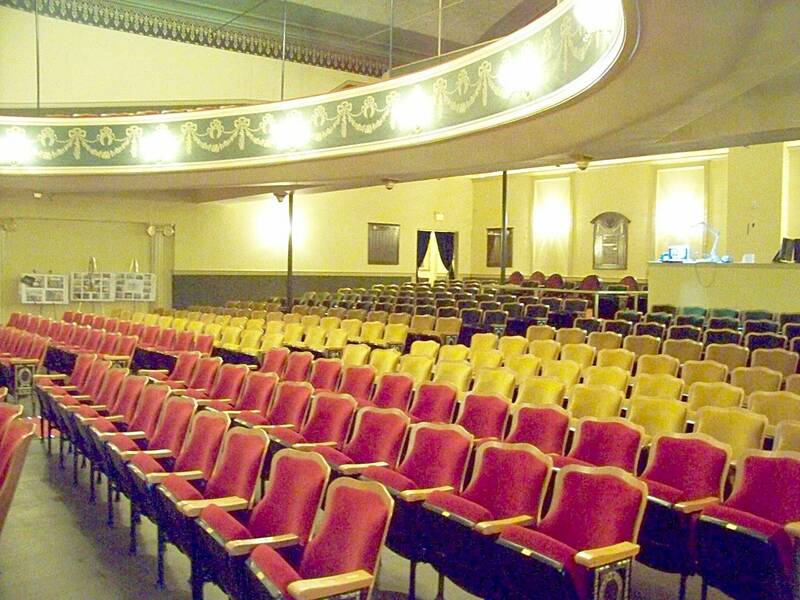 Movies were a mainstay of the Elks Opera House through the 1970s, with live performances returning in the 1980s. As a vaudeville house, the Elks changed managers several times, but in the mid-teens, Charles Born became manager, and stayed until 1942. Vaudeville was dying by then, and the Elks became largely a movie theater, although they occasionally held live events yet – most notably, the Elks Opera House hosted world-famous opera contralto Madame Ernestine Schumann-Heink in 1921. Charles Born turned the Elks into a successful movie theater through extensive promotion, treating all the films as big events, printing weekly flyers to be distributed, etc. 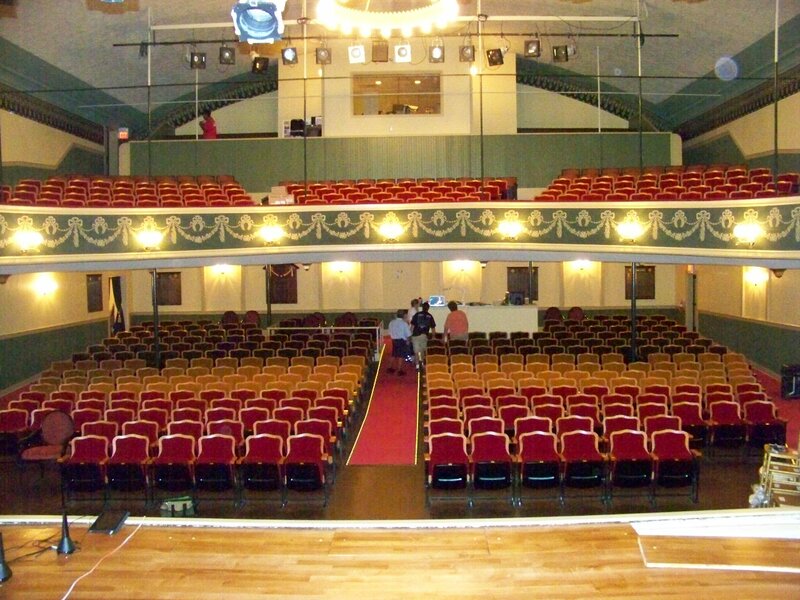 The Elks Opera House Original Interior. Photo UBP Sharlot Hall Museum. Reuse only by permission. 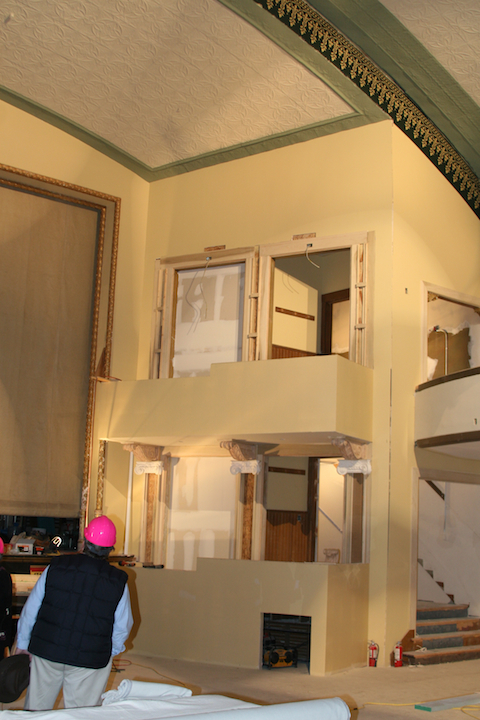 When we look back today, many question the wisdom of the remodeling in the Elks Opera House. But we need to remember these were business people trying to operate a profitable business and not historical preservationists. Styles were also changing across America and to compete, you needed the new “modern” look. Remember when all the grand oak woodwork was painted white in the 1930s because that was the “modern” look? The Elks underwent interior remodeling in 1928 (in the Roaring-twenties) and 1933 (during the depths of the Great Depression), resulting in changes still seen today; the lobby was ramped and an extra aisle was added to the balcony, among other things. Charles Born retired in 1942, and Claude Cline took over a manager. By that time, almost all live acts had stopped, and the Elks Opera House, then always called the Elks Theater, was exclusively a movie house. This is the second in a series about the Prescott Arizona Elks Opera House in Prescott Arizona. In the next installment, we will cover the later history in the period 1943-1967. Early 1900s Elks Opera House Interior. Photo UBP Sharlot Hall Museum. Reuse only by permission. In the early twentieth century there were numerous Elks Opera Houses across America. One hundred years later only one has survived in the entire country. This series traces the history of this unique structure; how it was built, how it was used, how it later was used as a movie house for 72 years, how it fell into decline, how it was almost lost and finally the story of its amazing restoration. The history of the Elks Opera House has mirrored the history of Prescott. Prescott, Arizona began as a gold mining and military encampment in 1864. President Abraham Lincoln chose Prescott as the Territorial Capital of Arizona because there were too many Confederate sympathizers in Tucson. The gold did not last very long (but you can still pan for gold today) and Prescott lost its place as the Territorial capital (after being the capital twice). It then evolved into a ranching community. But Prescott’s military encampment, Ft. Whipple, remained as an anchor. In the 1890 census, Prescott had a population of 1,789. In January 1896 the Elks Lodge BPOE 330 was founded. By the 1900 census Prescott’s population had exploded to 3,559. In August 1900 the Elks purchased a vacant lot on Gurley Street and later bought adjacent vacant property. The Elks originally planned to build the structure in order to have a permanent lodge; they had been renting various meeting rooms around town since 1896. They started to seriously consider an Opera House after the old Dake Opera House was bulldozed (in 1903; it was only half a block away). Construction was estimated at $50,000. Later, after a competing plan to build an opera house in Prescott did not materialize, a notice was published in the 1904 Prescott Daily Journal Miner urging businessmen of the city to attend a meeting on Feb. 12 to discuss a proposal from the Benevolent and Protective Order of Elks Lodge #330 to include an opera house, at an estimated cost of $15,000, to the building they were erecting on East Gurley Street. The residents of Prescott had migrated from the East and missed the entertainment they used to enjoy. They raised the necessary funds and the opera house was incorporated into the plans for the three-story building housing the lodge on the top floor, offices on the second floor and retail space on the ground floor. The granite cornerstone of the building was laid on April 3, 1904, with an excited crowd in attendance. The Elks held their grand opening on Monday, February 20, 1905. It included the stage show MARTA OF THE LOWLANDS by Angel Guimera, starring the then-famed stage actress Florence Roberts and billed as a romance of old Spain. The play itself, though forgotten today, was quite acclaimed at the time, and to this day there are streets and monuments in Barcelona named in honor of its fictitious hero, Manelic. The orchestra was composed of musicians from Prescott, Jerome and Phoenix. Opera boxes sold for $20.00 and general admission was $2.50. 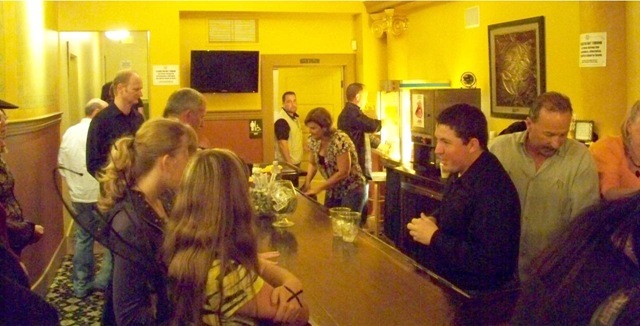 The box office proceeds totaled $1,225, leaving a $600 to $700 net profit for the Elks Lodge. This play was recreated as part of the 100th anniversary of the Elks in 2005. After that, the Elks hosted many more professional traveling road show plays and many local productions were staged. Prescott High School and St. Joseph’s Academy held their graduation ceremonies there (called “commencement exercises” in those days). Famous people who graced the stage during this period included bandleader John Philip Sousa, and former Presidential candidate turned evangelist William Jennings Bryan, both in 1909. This is the first in a series about the Prescott Arizona Elks Opera House in Prescott Arizona. In the next installment, we will cover the middle history of the Elks, from 1910-1942, when it was used for vaudeville shows that included short movies and later just for movies. Jack D. Wilson is the former Mayor of Prescott Arizona. He has had a long interest in history having founded two neighborhood historic societies in Chicago. He was instrumental in providing the funds that allowed “Bill the Elk” to return from Prescott Valley to his rightful perch atop the Elks Opera House. I am happy to announce that I will be collaborating with Parker Anderson, official Historian of the Elks Opera House, on a new series on its history. We envision that this series will encompass 5 to 8 blog posts. At one time there were many Elks Opera Houses in America. But today only three survive in the entire country. Two of these are being used as movie theatres. 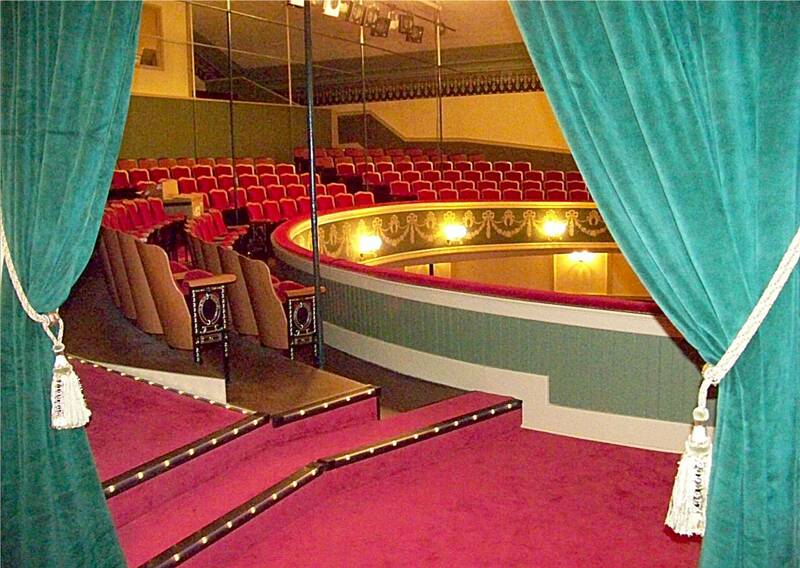 We have a real gem in our soon to be restored Elks Opera House. Parker Anderson spent thousands of hours documenting all the bookings in the Elk’s Opera House in its first one-hundred years. 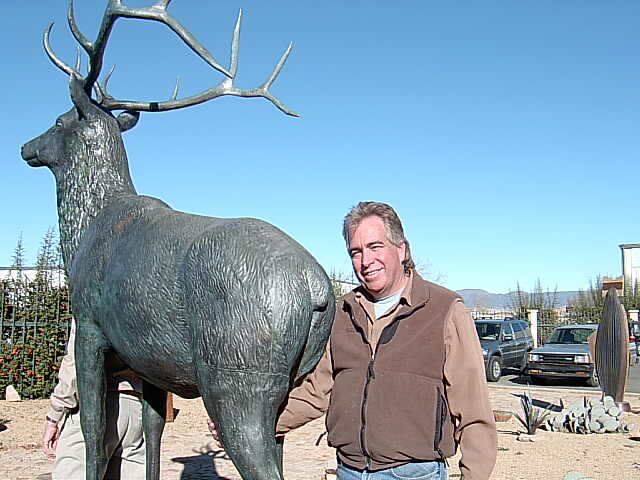 I provided the funding to return the original “Bill the Elk” from Prescott Valley to atop the building. I also served as President of the Thumb Butte Questers when all the Prescott Questers chapters raised matching funds for the grant that allowed the inner (or second) lobby to be restored. I hope that our collaboration on the Elks brings back many fond memories. Stay tuned for the first installment. Email Subscription - Keep me informed!